Use these spring resources to add interest and understanding to your spring-themed earth and life science lessons! 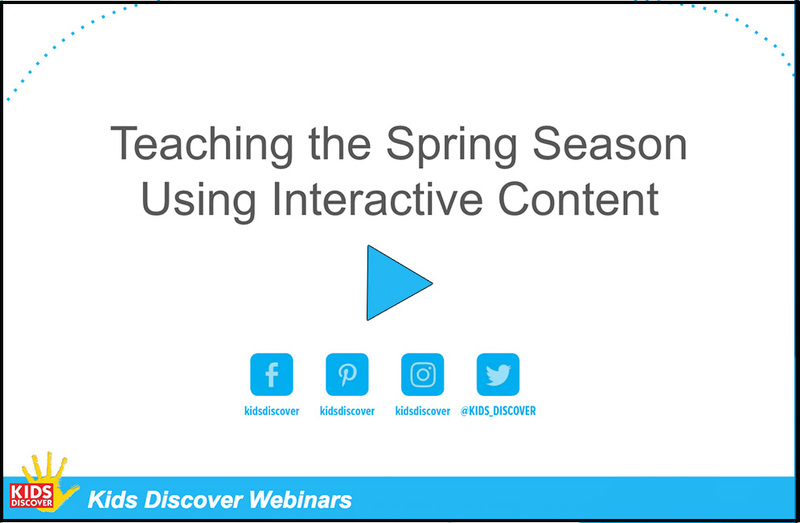 In this free 30-minute webinar, Kids Discover President & CEO Ted Levine will show you how to build custom units on Kids Discover Online that include tons of interactive content to bring reading to life. He’ll weave together concepts in geography, ecology, and plants to create custom spring-themed units your kids will love. No time to watch? Here’s a summary of the event. Feel free to share! This unit explains ecology for kids with charts that show how the food chain works and a discussion of Earth’s 10 “biomes”, and will generate lively discussions with facts about our “ecological footprint”. Seeking more info on the fascinating world of plants? Learn more about these key components in the food chain, Plants provides a comprehensive introduction to the way they grow, reproduce, and are central to all facets of human life. Not just things of beauty, flowers, in this unit, are revealed in all their diverse glory, from the stinking carrion flower to the fly-eating birthwort. Kids first follow a flower through its entire life cycle, from seed to bloom and back again. 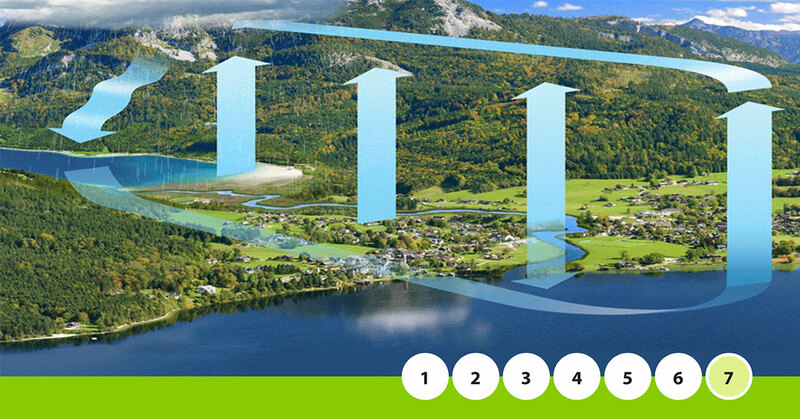 Teach kids about the amazing process of Photosynthesis with our free, visual infographic. Available now on Kids Discover Online! The life span of an adult butterfly or moth is amazingly short.A few adults live as long as 18 months, while most last no more than two weeks. Each of them, though, goes through one of the biggest changes known to nature. 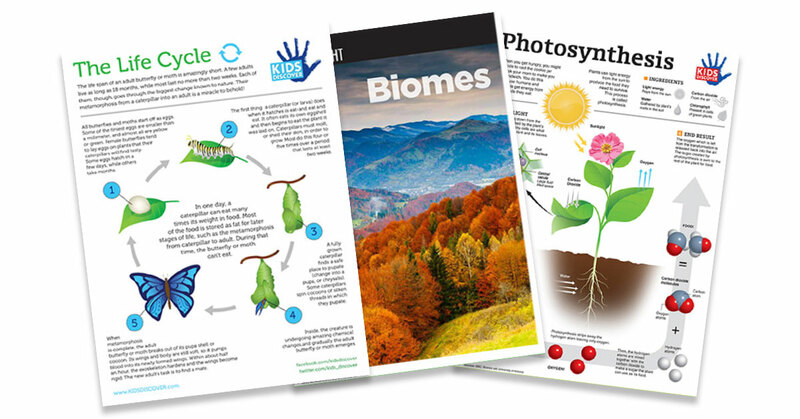 In this downloadable Spotlight, get 8 packed pages of information about the world’s major biomes. An ideal curriculum supplement, this free infopacket includes full-color photos and a 5-question assessment with answer key. Download, print, pin and share! 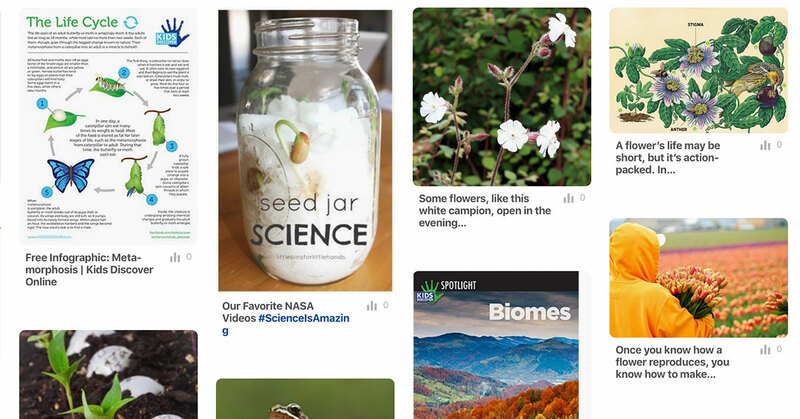 Check out our new spring themed board on Pinterest! Happy Pinning!